The reasons we wanted to be a sports reporter sometimes gets lost in the daily grind. We deal with daily deadlines that must be met. It doesn’t matter if your computer crashes or your phone doesn’t work. You find a way to get the story in. Some athletes are tough to deal with. They find sports reporters to be intrusive (and we can be) and try not to deal with us even though we still have a job to do. It’s not always fresh roses as the fantasy paints it. However, that’s not saying you’re not allowed to have fun. One of the reasons I collect baseball cards is because it allows me to remain a fan even when stuck at an extra-inning game that already had a 97-minute rain delay. Collecting baseball cards allows me to enjoy the parts of the game I loved as a kid and made me want to pursue this vocation. Once you stop being a fan, you become those crotchety old men who only know how to complain and forget that you write about a game for a living. This past week I was on vacation and told myself I was just going to be a fan. I went to the Eastern League All-Star Game on Wednesday night. I got there around 3:15 p.m., for the autograph session and came away with just one signature. It was Yankees prospect Jesus Montero, who is playing extremely well in double-A. (He hit a grand slam on Saturday.) It was the only thing I wanted. I almost didn’t get the autograph because there were literally two minutes left until the session was over - after standing on line for 40 minutes – and about seven or eight people in front of me. 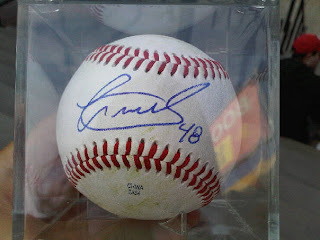 I looked at Montero, waved the ball to him, he reached out, grabbed the ball and signed it. I felt a little strange doing this considering just two weeks ago I interviewed Montero for a little piece I did for The Cardboard Connection. I hoped he didn’t recognize me, but I wore my glasses that day. That disguise always worked for Superman. On Thursday, I went to Lakewood to watch the Phillies single-A club. It was Cole Hamels bobblehead night and I got nice bobbing head doll of Hamels holding the World Series MVP trophy. Bowling Green won 14-11, but was up 9-1 at one point. I saw a little bit of everything in that game, including an inside-the-park home run. It was good to be a fan this week. Now, I get back to vacation feeling refreshed. It's good to be a fan. I interviewed for a Baseball related job once, and one of the issues I considered is how it would affect my status as a fan and weather I would get sick of sports in baseball if thats what I did for a living. I sat behind Jesus Montero's parents and insanely hot girlfriend (at least I thought it was his girlfriend) at a Braves-Yankees ST game. They seemed like good people. I'm hoping the Yanks don't trade him, he is a monster.